Stressing about the location of your classroom on the first day of lectures is not a good feeling. Although Laurier is known for its small campus size, it’s a good idea to look ahead to ensure you know where you’re heading. First things first, find out your detailed course information. Once you have registered, log in to LORIS and select “Registration” > “Student Detail Schedule.” This provides you with your detailed course schedule, outlining essential information including; day(s), time, building, and classroom location. Detailed course information can also be found on the new students.wlu.ca website, where personalization features put you in the driver’s seat. Use the My Laurier tab to log in with your student credentials and manage your display options for quick and easy access to your timetable. Once you become familiar with Laurier campus building codes, this feature can become your go-to reference for your classroom location. Now that you have your course information, you can find the building location using Laurier’s interactive maps. The maps allow you to customize your campus search to help you get where you’re going. Select “Lecture Halls and Classrooms” and click on a building to receive a visual aid alongside the location. Now that you’ve found the building, you’ll have to find your classroom. The first numeral in a classroom listing indicates the building floor. For example: if your classroom listing is 2-108, your classroom is located on the second floor, room 2-108. The classroom listing can also indicate the building code. For example: if your classroom listing is BA429, your classroom is located in the Bricker Academic Building, on the fourth floor, room 429. Take the time to find your classroom prior to the first day of lectures – it’s worth it. Not only will you alleviate stress by knowing exactly where you’re going, a prior visit allows you to determine how long the trek is from your residence so you can arrive on time. Going in advance also allows you to scope out the nearest food sources, restrooms, and water fountains. The first day of lectures should be exciting, not stressful. 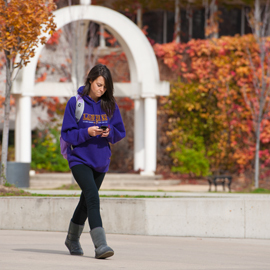 Familiarize yourself with Laurier’s campus and effortlessly find your classes.